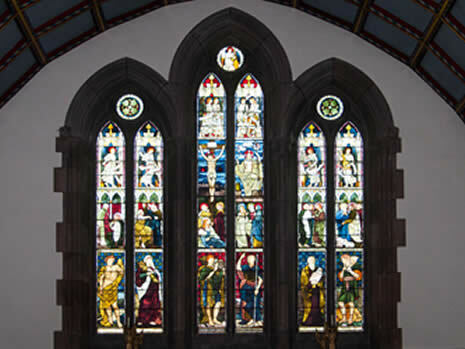 In May 1879 Henry Holiday placed an order with Powell and Sons for the East window of St. John’s Church, Keswick, the bill to be sent to Reginald Dykes Marshall, Esq. Henry Holiday who carried out the design was the principal designer for James Powell and Sons, who originally erected the window in 1879. When the Chancel was extended in 1889 Powell’s removed the glass and later replaced it. The lower figures illustrate Old Testament Stories. From left to right, Naaman, Ruth, Isaac, Jonah, Isaiah and David. Above them are New Testament scenes, Christ and Nicodemus, Christ and the Woman of Samaria, The Crucifixion, The Resurrection, Christ healing the blind and Christ charging Peter to ‘Feed My Lambs’.